26 | Kitchen & Bath Design News | March 2015 A sk most kids and they'll tell you they can't wait to be older so they can do more. Ask their parents or grandparents and the word "older" is rarely mentioned. Yet, these Boomers and seniors are doing so much more than they ever dreamed at this stage in their lives. They're completing marathons, tri- athlons, adventure travel, endurance challenges and obstacle course races in exploding numbers (see related Editorial, Page 5). Along with all of those youthful pursuits come sports injuries, muscle stifness and a parallel explosion in knee and hip replacements. So, while they may be squeamish about discuss- ing "aging-in-place" – with its dreaded "a" word – homeowners in the 50-plus demographic are increasingly interest- ed in the benefts of accessibility. That last mile or fre jump may get the credit. Or it could be their arthritis, activated by overuse. But every survey points to this trend, and both designers and manufacturers are paying attention. DESIGN SIDE In the "2015 Kitchen and Bath Style Report," the National Kitchen and Bath Association reported that 57 percent of NKBA designers specifed accessible and/or Universal Design features in bathrooms and 56 percent incorporat- ed them into kitchens the prior year. That doesn't mean clients like talk- ing about it. Designers have shared in networking groups that many homeowners are still uncomfortable contemplating their aging needs, and even "Universal Design" can conjure up images of wheelchairs and institu- tional fxtures. Some designers have changed the discussion to "inclusive design," "accessible design" or a new term discussed at a recent seminar dubbed "athlete-in-place design." 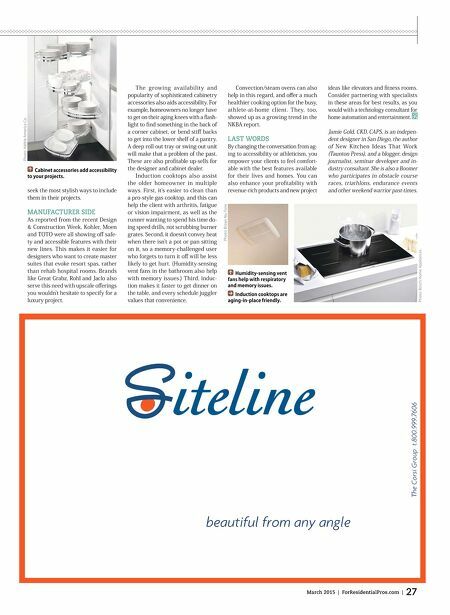 "A majority of respondents antici- pate adding features such as shower benches, comfort-height toilets and vanities in baths; and microwave drawers and touch-activated or touch- less kitchen faucets," the NKBA survey shared, adding that "the demand for easy maintenance spaces and prod- ucts is also growing." These features benefit the able-bodied weekend warrior and time-pressed, sandwich- generation Boomer balancing her needs with those of her teens and aging parents as much as they help the traditional aging-in-place client. A 2014 Home Design Trends Survey from the American Institute of Archi- tects points to a strongly increased interest in ramps or elevators, on-grade entries, ftness rooms and homes that can accommodate multiple generations. The aging-in-place conversation you have with your next client may focus on their in-laws, rather than themselves. These all aid the homeowner transi- tioning into retirement and wanting to remain at home, rather than moving into a senior living facility. Studies con- sistently show that the vast majority of older adults prefer this option. The ftness room trend is one that kitchen and bath designers are well poised to tap into. Knowledge of er- gonomics and clearances supports design of spaces with large, heavily used equipment and storage, fooring and lighting planning to surround it. Cabinet dealers can propose solutions to store a homeowner's gear and house a television for use while working out. Even the inclusion of large mirrors lends itself to the designer who has been creating successful bath projects for years; some of these ftness rooms will even be part of luxurious master suites, so they can take advantage of adjacent showers and fxtures. As steam showers were showing a trend increase in the NKBA survey, that's defnitely a discussion point for the shower component of a ftness suite. Age-defying clients who partici- pate in athletics may also be more receptive to the safety conversation of aging-in-place than the aver- age age-denying homeowner. After all, to successfully complete their events, they need to remain safe and uninjured. That mindset is easily transferred to a home space with its accessible add-ons that accommodate this need. According to a Research In- stitute for Housing America Special Report, 80 percent of Americans in the 55 and older demographic were homeowners and only 31 percent of them have special safety features at home. 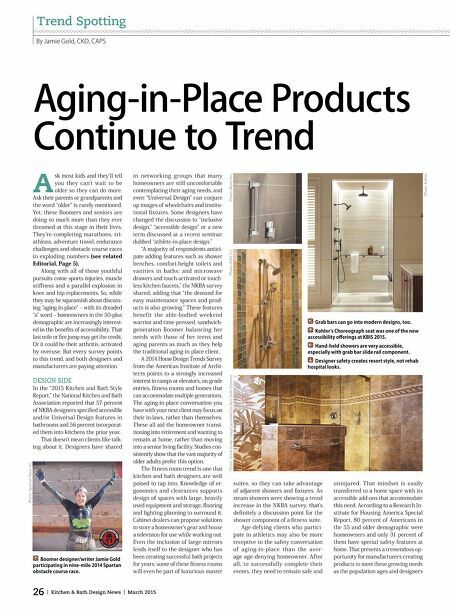 That presents a tremendous op- portunity for manufacturers creating products to meet these growing needs as the population ages and designers By Jamie Gold, CKD, CAPS Trend Spotting Aging-in-Place Products Continue to Trend Grab bars can go into modern designs, too. Kohler's Choreograph seat was one of the new accessibility oferings at KBIS 2015. Hand-held showers are very accessible, especially with grab bar slide rail component. Designer safety creates resort style, not rehab hospital looks. Boomer designer/writer Jamie Gold participating in nine-mile 2014 Spartan obstacle course race. Photo: Kohler Photo: Moen Inc. Photo: Rohl LLC Photo: Great Grabz image provided by Best Bath Systems Photo: Spartan Race, Inc.